2-3 TBS each - Water and Corn Starch (mix together. **Combine all of the batter ingredients together and mix well. Combine vinegar, water, sugar and ketchup in a large pan. Bring to a boil, then add carrots, bell pepper, onions and let cook to desired doneness. Add pineapple, red food coloring and cornstarch slurry. Mix until thickened, remove from heat but keep warm. Fry pork in 350º oil for 2-3 minutes until golden brown and cooked through. 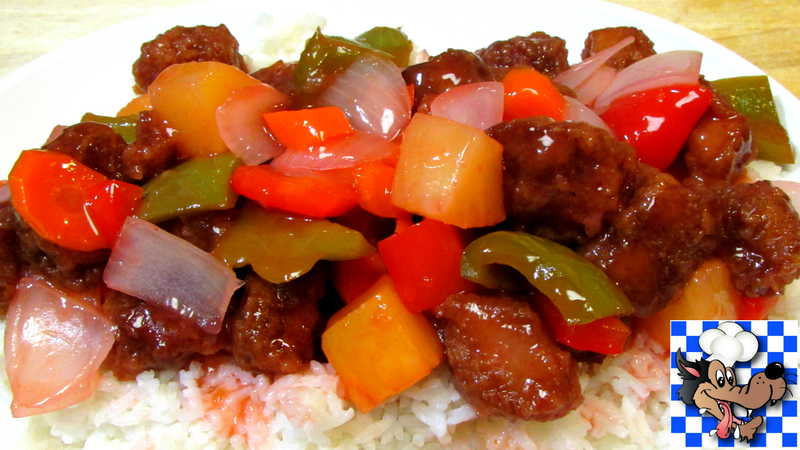 Mix individual servings of pork and sauce together and serve immediately over rice. ** If batter is too thin add more flour, if it's too thick add more water. Wow! Got to make this real soon. I'm guessing you could sub chicken for the pork and get Sweet and Sour Chicken? Would you have to change anything else? Love, love, love your channel! Yes you can sub chicken or shrimp and won't need to change anything! Let me know how you lie it! Thanks!